If you do a lot of canning, you need a good quality pressure canner, and All American pressure cookers double as pressure canners as well. It has both a safety-valve with a weight plus a pressure gauge, and you can set the pressures at 5, 10 and 15 psi (if you are canning you need the higher psi). The handles are made of stay-cool bakelite, and it also comes with two canning racks so you can stack jars inside, and an instruction leaflet and recipe book. The only small drawback is that you cannot use these pressure cookers on glass top or ceramic top ranges because the sheer weight of this pressure cooker - they are made from seriously heavy duty cast aluminum. As the name implies these pressure cookers are made in the USA and come in a range of sizes - see below. 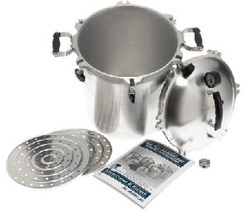 The most popular for canning is the 21.5 quart pressure cooker/canner.